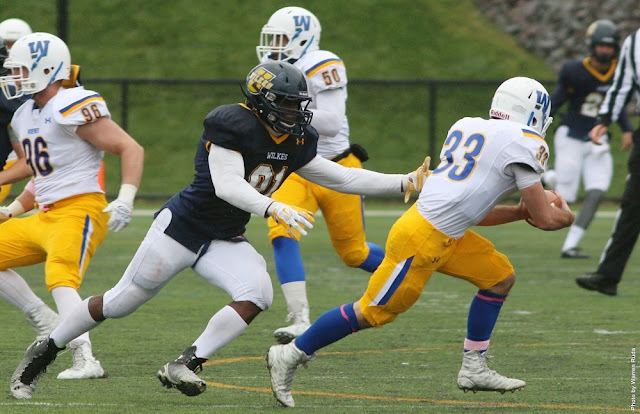 ANNVILLE, PA – Nine Wilkes University football standouts were named to the All-Middle Atlantic Conference football teams Tuesday as announced by the conference office. Senior defensive end Jason Ugwu (Collegeville, PA/Perkiomen Valley) was named to the first team, while sophomore tight end Garrett Armstrong (Hampton, NJ/Kittatinny) was named to the second team along with junior linebacker Tanner Stengel (Allentown, PA/Parkland). Six Colonels were named as Honorable Mention selections including junior quarterbackRyan Dailey (Easton, PA/Wilson), junior wide receiver William Deemer (Washington Township, NJ/Warren Hills), senior punter Bryan Mellon (Pottsville, PA/Nativity B.V.M. ), senior safety Jared Powell (Easton, PA/Easton), sophomore offensive linemen Ryan Bowman (Hanover, PA/Hanover) and sophomore safety Isaiah Robinson (Pittsburgh, PA/Milton Hershey). Ugwu earned his second consecutive All-MAC honor and his first as a first team selection. The senior defensive end caused havoc in opposing team's backfields finishing his final year at Wilkes with 60 total tackles, 10.5 tackles-for-loss and 4.0 sacks. He also led the defensive unit with three forced fumbles while recovering two fumbles including one for a safety. Stengel proved for the second straight year why he is the best linebacker in the MAC topping the entire league with 130 total tackles including 70 solo stops. He also led the team in tackles-for-loss with 15.0 and sacks with 4.5 in ten games. Armstrong enjoyed a breakout year as a sophomore in Wilkes high-tempo, passing offense collecting 35 receptions for 334 yards and three touchdowns. The tight end averaged 33.4 yards per-game including a season-long 51 yard grab against Widener on Homecoming. Dailey continued to climb up the Wilkes passing record book in his junior season throwing for a single season record 2,509 yards on 258-for-423 passing. He also set single season marks in both completions (258) and attempts (423) while throwing for 12 touchdowns on the year. Dailey was also efficient through the air finishing with a 60.9 completion percentage while throwing for 250.9 yards per-game which led the entire league. Deemer proved to be Dailey's top target throughout the season finishing with a team-high 54 catches for 602 yards and two touchdowns. He averaged 60.2 yards per-game receiving while also playing in the kickoff and punt return game for Wilkes averaging 16.6 yards per-kickoff return and 9.0 yards per-punt return. Mellon used his leg all year to pin opponents deep inside their own end punting 61 times for 2,320 yards. He averaged 38.3 yards per-punt including 18 punts downed inside the twenty. Mellon posted two punts over 50 yards, with a season-best 54-yard punt against Stevenson in late October. Bowman anchored the Colonel offensive line starting in all ten contests at guard helping to protect Dailey and the high-powered Wilkes offense. Powell and Robinson led the Wilkes secondary all season from their safety positions. Robinson finished second on the team in total tackles with 75 while Powell posted 53 stops on the year. Robinson added one interception and two pass breakups, while blocking a key punt in Wilkes win at King's to end the season. Powell was equally as impressive finishing with a team-high eight pass breakups, two interceptions and one fumble recovery for a touchdown. For his play in the Mayor's Cup game, Powell was named Wilkes Team MVP.